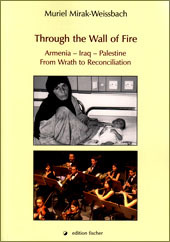 The Armenian Reporter: Armenian Cultural Foundation to launch "Through the Wall of Fire"
it can bring us closer together and thus increase understanding as well as mutual tolerance." The book by Muriel Mirak-Weissbach was presented at this year’s international Bookfair in Frankfurt. Its publication is well timed since it comes out at a moment when, for the first time, a real strategic chance is opening up for a "historic" reconciliation between Armenia and Turkey, the opening of the borders, followed by a deep economic, political and cultural cooperation between the two countries. The book tackles the question whether people and nations who have been pitted against each other in geopolitically manipulated conflict can ever reach true reconciliation and peace. The book presents three case studies: It begins with the Armenian genocide 1915 which the author Muriel Mirak- Weissbach, born of Armenian immigrant parents in the United States, documents in shocking detail on the basis of eyewitness reports written by her parents who survived the genocide. The trauma which her parents had to live through in 1915 is very similar to the one which many Iraqi families, parents and children had to experience during the 1991 Iraq war, "Desert Storm", which is the subject of her second case study. The author documents the devastating, genocidal effects of the war destruction and the embargo on the Iraqi civilian population, in particular, the children of Iraq. In response to this horrendous situation the author in the year 1991 led an initiative, which became known as the "Committee to Save the Children of Iraq." Enjoying support from several UN-related NGOs and receiving help from many donors around the world, she describes how it was possible to overcome the "burocratic" obstacles which were put up by US officials as well as certain officials within the UN Security Council, and to organize the necessary logistics for the transport (air and overland) of urgently needed medicine and food. In 1991 and 1992, she accompanied various airlifts from Frankfurt to Iraq. She gives shocking eyewitness reports on the desolate situation in most of the Iraqi hospitals which she visited in Baghdad, Kerbala and Najaf. Numerous stories about the Iraqi children echo the stories of the children in the Armenian genocide. Many children were saved, thanks to the "Committee" which flew dozens of children out of Iraq, to be treated for free in clinics in Germany and the US. The third case study deals with Palestine whose desolate refugee situation goes back to the "Nakba"(Catastrophe) in 1948. The author, who travelled many times to Gaza, Amman and other mideast regions in 1993 and in the following years, made interviews and gathered eyewitness accounts from several members of the older Palestinian generation, those who survived Nakba. She uses documentary material which has been assembled by "new historians" from Israel, among them Ilan Pappe, who in 2008 published his book "The Ethnic Cleansing of Palestine". The three case studies presented in the book are interrelated. In each of them children were the main victims, and the method of operations conducted against the civilian populations and children was very similar. The core thesis of the book is the question: How is it possible to overcome the traumatic experience of ethnic cleansing and war? It is only possible, Mirak-Weissbach underlines, if in each of the cases the conflicting parties are able to face the historical truth, and if the geostrategic interests, who were instrumental in those conflicts, are identified. Following the poetic method which the Italian poet Dante used in his "Divina Commedia", the author urges us to look beyond the span of centuries-old conflicts. In order to overcome the vices of "Hatred," "Envy," "Gluttony," etc., which according to Dante were at the root of centuries-old conflicts in the history of humanity, the historical truth must be faced by the adversary parties. They should have the emotional will to go "through the wall of fire" (in Dante's Purgatory) and enter into true dialogue. An important precedent for such a process of peace and reconciliation can be found in the 1648 Peace of Westphalia, which ended decades of religious conflict in Europe, the author tells us. The two extraordinary concepts on which that peace agreement rested were that, whatever atrocities had occurred on either side, they must be forgiven and forgotten; and that, to secure peace, each side must act in the interest and for the benefit of the other. However, such a peace treaty in itself is not sufficient guarantee for true reconciliation and peaceful coexistence. Additional "leverage" must be used, in order to overcome the moral obstacles and bring about a real understanding: "Cultural dialogue." The precedent for this is the initiative which the famous Argentine-Israeli conductor Daniel Barenboim and his Palestinian friend Edward Said launched 10 years ago when they founded an Israeli-Palestinian-Arab youth orchestra to perform classical music. Both Edward Said and Daniel Barenboim demonstrated how the moral attitude of individual Israelis and Palestinians can be altered through the power of great music. Very few people today know what occurred during the 1915 Armenian genocide that killed 1.5 Million Armenians. The truth about it has been transmitted to posterity by people like the author's parents, who survived the horrors of the genocide as orphans. Their eyewitness accounts belie what one of the main architects of the genocide, Turkish Interior Minister Mehmet Talaat, said in a 1915 directive: "Pick them up and take care only of the orphans who will not be able to remember the atrocities that their parents were subjected to. Send the others to the caravans (i.e to be killed)." The author's parents wrote down their eyewitness accounts with the aim that their children and grandchildren would never forget: "I was just an infant when the mass killings started, 1915-1916. Our village people were gathered in the church hall; all the men, women and children were kept there for days," begins the report of her mother. "The gendarmes, the Turkish soldiers, took groups at a time, to a distance of five or ten miles, and shot them to death. My mother, my grandmother, and other women and children were grouped, and shot to death. My mother held me, her infant baby Artemis, to her breast, so that the baby would die with her. But the bullet missed me. My mother was left with the dead bodies. (..) A few days later a Turkish shepherd grazing his sheep nearby, heard an infant crying among the dead bodies. He picked up the little infant and carried her; and left her on the steps of a Turkish mosque. I don’t know for how many days this infant was left outdoors. Then one day came a gendarme of this town, called Omar. He took pity seeing this infant, carried her home, and asked his wife Gulnaz to take her in. They had no children. She refused to take her in; she was not going to take care of a 'Giavour' child, a Christian and she was too old anyway to take care of an infant. But finally, she consented to keep her overnight." The mother recounts that she was raised with loving care in a Turkish family (as many Armenian orphans experienced), until in 1917 she was retrieved by her cousin Joovar, who later also took her to the U.S.
"The Third Massacre took place approximately in the middle of 1916. It included all the old people, men and women and children. They gathered them in the church for four days and, on the fifth day, they brought them to the centre of the town. I then ran to my house which was about 100 yards away. As you entered the house, my grandmother was lying on a couch, she was very ill. I ran back in the stable to hide. I then heard Topal Nury come and ask my grandmother where I was. She told him she had not seen me; he then left. Nury was the chief executioner of the whole region of that part of the Turkish province. 'Topal' in Turkish means 'lame,' so it must have been a nickname. The final massacre took place less than a mile outside of town. Because of their inability to walk any further they were all killed there." The author also makes use of eyewitness reports (1916) such as the one given by the Swiss doctor Jakob Kuenzler, who had travelled to Turkish Armenia, and by Dr. Johannes Lepsius, the famous German doctor and pastor who founded the Deutsche Orient-Mission hospital in Urfa. Kuenzler witnessed the deportations that were organized to slay Armenians by the thousands. His testimony is rare and rich in implication because he was totally neutral. Having had access to Turkish authorities, Kuenzler recorded a discussion which he had with the leader of the Young Turks, Major Nefiz Bey, who told him point blank: "We Turks must either exterminate the Armenians utterly and completely or force them to emigrate. Life with them within the boundaries of our empire is completely out of the question." A similar testimony was given by the Lepsius who spent three weeks gathering accounts from eyewitnesses and on that basis compiled the "Report on the Situation of the Armenian people in Turkey," which appeared first in 1916: His book identified the regions(- Cilicia and Northern Syria, East Anatolia and West Anatolia-) where systematic genocide was organized in addition to giving a comprehensive overview about how the massacres were carried out. According to Lepsius the aim of the Turkish authorities to prepare the massacres "was to round up the leaders of the community, the intellectuals, priests, teachers, and village elders. Once the leaders had been neutralized or killed, the Turks moved against the hapless civilians, sending them to their death." As for who devised and implemented the operation, the author identifies three levels: The killer squads organized in units called the "Special Organization" whose task it was to liquidate the Armenians. There was as well an "Executive Committee of Three" which ran the killer squads and there were those who devised the policy. These were in particular three leading members of the "Young Turk" organization, or Committee for Union and Progress (CUP), Talaat Pasha, Enver Pasha and Djemel Pasha. Inspired by the vision of creating an ethnically clean Pan-Turkic empire, they were condoned by certain geopolitical British interests. These "imperial" interests, represented by people such as Cecil Rhodes, Lord Alfred Milner et al. at the eve of World War I, played the pan-islamistic or pan-turkic nationalist currents against the Ottoman Empire; in the war they shifted to support the Arab rebellion with the aim of breaking up the Ottoman Empire, preventing an "Eurasian alliance" (between Russia, Germany, France) and redrawing the map of the entire region. The same imperial interests after the war made sure that some of the key Young Turk leaders were put on trial and indicted for deliberately plotting the massacres. Most of them were found guilty and condemned, but in absentia, because they had been able to flee Turkey in time. They were later killed by Armenian assailants abroad. From the Armenian genocide the author draws a line to the fate that many Iraqi children were subjected to during the 1991-war "Desert Storm." In the course of this war, the entire infrastructure of Iraq was destroyed, including thousands of roads, bridges, power plants, numerous water treatment facilities, and telephone communications. Due to the embargo, which was imposed upon Iraq, the resulting lack of medicine and food led to the death of up to 500,000 Iraqi children perished. Mirak-Weissbach became one of the principal architects of an initiative "Committee to Save the Children of Iraq." The aim of this NGO, ounded in 1991 in Bonn, was to organize donors as well as transport facilities in Europe and the U.S., so that urgently needed medicine and food could be brought to Iraqi hospitals, while at the same time care would be provided to many wounded and traumatized Iraqi children, who could not be medically treated in Iraq. The Committee was inspired by Russian Scholar and Academician Professor Grigori Lvovich Bondarevsky, "whose idea it was to launch a humanitarian initiative to provide urgent medical and food supplies to the young victims of the war and the genocidal sanctions and thus wake up the world to the human dimension of the new slaughter." The initiative also found support from Prof Dr. Hans Koechler, an Austrian scholar and President of the International Progress Organization (I.P.O. ), as well as from the Patriarch of the Chaldean Church of Babylon, His Beatitude Rapahel I. Bidawid, whom the author personally met and interviewed at the time. Prince Sadruddin Aga Khan, responsible for the relevant U.N. office in Geneva, was central to the success of the effort. Enormous logistical efforts had to be undertaken which included organizing food and medicine and the aircraft to fly them from Frankfurt to Baghdad. The author was able to accompany most of these flights together with her husband. She gives very moving reports about what she saw in the hospitals, telling us about the history of children, like the four-year-old Iraqi girl Sabreen and others, who could be flown out and treated in German clinics: The "Committee to Save the Children of Iraq" by that time had received significant media coverage in Germany and the U.S., which was able to break through the silence concerning the humanitarian situation in Iraq. The Committee worked closely with distinguished human rights lawyers, such as Dr. Koechler, and Dr. Francis Boyle from Chicago, who each presented devastating documentary evidence to the UN Security Council in New York and other UN related institutions in Geneva which proved that the effects of the embargo imposed upon Iraq were tantamount to "crimes against humanity." They were able to document together with the "Harvard Study" that in the years before the 1996 "Oil for Food Program" which itself was a paltry effort – hundreds of thousands of Iraqi children had died. A political journalist who has travelled widely throughout the Arab and Islamic world, Mirak-Weissbach presents in her third case study the tragic situation of the Palestinian refugees which, as she documents, began with the ethnic cleansing i.e. the infamous "Nakba" of 1948. The tragedy of the Palestinian refugees, who up to this day are being denied the right to live in a sovereign homeland, was revisited during the recent Gaza war which in December 2008/January 2009 was launched by the Israeli Defense Force against the Palestinian population in Gaza. The war left an estimated 1,400 Palestinians dead and thousands wounded, and decimated vital infrastructure. Worldwide this war produced a public outcry. Many reports have been published in the interim including the U.N.-mandated "Goldstone Report", and the Amnesty International report which, together with several Israeli organizations, have qualified the effects of this war on the Palestinian refugees as "war crimes". The author moves from the Gaza war back in time to 1948, to show the origin of the policy of war and exodus of the Palestinians (there are today 6 million Palestinian refugees with no sovereign homeland living in Gaza, the West Bank, Jordan, Syria and Lebanon. She makes reference to various historical studies, one compiled by Palestinian historian Walid Khalidi in 1961 on "Plan Dalet", a blueprint for the expulsion of the Palestinians, the other study by one of the Israeli "new historians", Ilan Pappe. In his book, "The Ethnic Cleansing of Palestine"(2008), Pappe documents how in 1948 the Nakhba policy was implemented. The aim of Nakba, according to Pappe, was to expel the native Palestinian population, occupy and destroy their villages, farmlands and cities. The general method which was applied : (…) "approaching/ encircling a village, then attacking it with bombs or shooting to terrify the population. Local leaders were rounded up together with other suspected persons whose names had been gathered by the spies and were taken out to be executed. Once the towns people had taken flight, their homes farmland and public buildings would be torched or razed." Mirak-Weissbach received eyewitness reports from a few survivors of the Nakba, among them the Palestinian artist Tamam Al Akhal, widow of the artist Ismail Shamoun, also an exiled. Tamam Al Akhal, who as a child lived with her family in Jaffa, describes what happened on April 28, 1948. At that time in the middle of the night the family of the 12-year old child was woken up by a knocking on the door, and screams were heard saying: ’Barra, barra!' That means 'Out!' In the middle of the night the family had to flee. "We were 10 children and 2 boys who worked with us, there was a one-year old baby among us. Then we saw some Jordanian soldiers, with peaked hats, -- or at least we thought they were Jordanian soldiers. Instead they were Jews who had taken the soldiers’ uniforms and put them on. They opened fire- ‘dum- dum-dum’ -many were killed or wounded, others jumped into the water." Like many other Palestinian families, her family was able to flee to Lebanon and ended up living as refugees. Another report was given to the author by 85-year-old Ibrahim Saleh Hussein, who came from a village near al-Ramla: "The problem began long before 1948," he said. "Back in the 1920s, following the Sykes-Picot treaty, which divided up Arab lands between the British and French, the British started bringing in Jews to a Jewish settlement nearby. This was the application of the policy contained in the Balfour Declaration. Tensions grew with the number of settlers and clashes broke out [between the Palestinian population and Jewish settlers] in 1926 and 1936." Those tensions exacerbated in 1947 and 1948 when a full conflict broke out. Hussein gives his account of how the expulsions of Palestinian civilians began: the Israelis would enter (...) "one village after the other, killing some of the residents, while others escaped." There was random killing, most escaped as Hussein did with his family until they reached Jericho and settled there for a while. "We all lived in refugee camps." The application of such noble principles to overcome the Armenian-Turkish conflict today would require acknowledging the historical facts. On the concrete economic plan, it means reopening the borders to Armenia (since August of this year this has been the subject of ongoing negotiations between the Armenian and Turkish government, which were mediated by the Swiss) to allow the flow of goods and persons, to the economic and social benefit of all parties, including the respective modernization of road and rail transport routes as well as new forms of energy cooperation. Yet, as important as it is to apply the principles of the Treaty of Westphalia as a premise for peace, this itself is not enough. The author underlines that what is necessary is a moral ground on which peace can be built and this is only possible by cultural dialogue. The Israeli conductor and pianist Daniel Barenboim and his late Palestinian friend Edward Said, have proven in principle how the moral attitudes of individual Israelis and Palestinians can be radically altered through the power of great music, in their work with the West-Eastern Divan orchestra, which they founded 10 years ago (1999) in the city of Weimar, made up of young Israeli and Arab musicians. Unforgettable is the historic concert which the West- Eastern Divan orchestra performed in the year 2005 in Ramallah.